This image represents another example of exposure blending. Waterfall photography is often challenging because of the extreme tonal range. In this scene, there are bright tones in the cascading water, extremely bright tones in the clouds, mid-tones in the trees and foliage, and very dark tones in the rocks. If not for exposure blending, there's no way I could have produced a pleasing image of this scene. In fact, in the past I never would have bothered to try to capture this composition, as including the sky introduces far more tonal range than a single film or digital capture can handle. 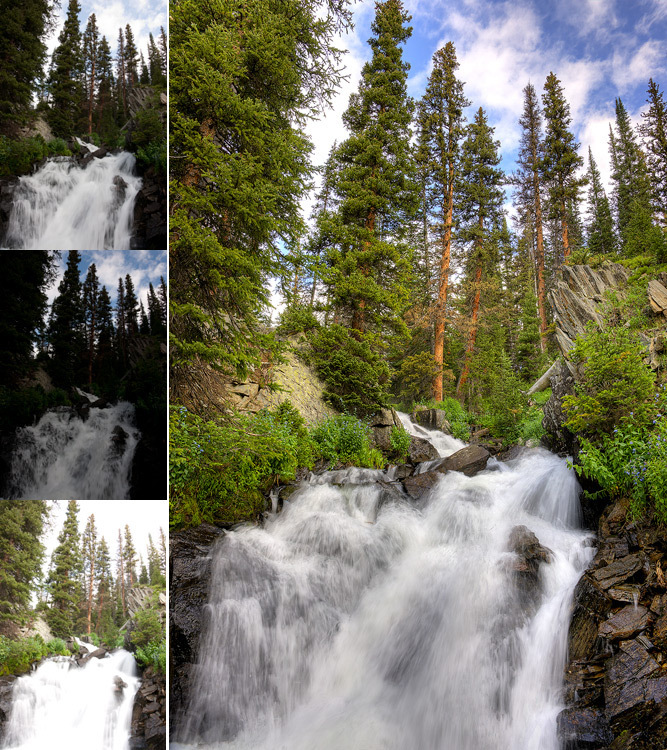 However, by combining the three images on the left in Photomatix, I was able to faithfully depict the beauty of this waterfall in French Creek Canyon in the Snowy Range.